Aging was once seen as an inevitable part of life. However, it has become something that could be overcome after a discovery was made in the 1990s that life expectancy of Caenorhabditis elegans (C. elegans) changed when its genes were partially modified. Aging research is a popular area in which many scientists across the world are working. These efforts extend to Korea’s basic science field as well. One of the most distinct aging research teams in the country is the IBS Center for Plant Aging Research. We heard from three research fellows who study different organisms but are commonly searching for a better understanding of aging mechanisms and ways to control aging. Q: I was told that each of you are studying different organisms. How are your individual research objects different? HONG Sung Hyun: I am working on arabidopsis, a model plant, to study plant aging. HAHM Jeong Hoon: My focus is C. elegans, an important model animal to study the aging of animals. KIM Yumi: The turquoise killifish is my research object. It is closest to humans among the three as it is a spinal animal (vertebrate). Q: Plant, invertebrate, and vertebrate - there is quite a difference in what you are working with. How is aging research of different organisms connected to one another? KIM Yumi: What we are ultimately trying to figure out is aging in humans. However, we are working on plants and animals because it is very challenging to study human aging on human itself. To study aging, one needs to observe the overall process of organisms becoming older. However, mammals have a longer lifespan, which makes their aging research more difficult. What is fortunate is that there are a lot of similarities between the aging process of humans, and that of other animals and plants. My research object, The turquoise killifish, experiences symptoms of aging similar to those of humans, such as weakening eyesight, Spinal curvature, and neurodegeneration. So we set up a universal aging theories by studying plants and animals with shorter lifespans, and apply such theories to humans. These animals and plants that help to establish general theories are called ‘model animals and plants’. The turquoise killifish has the shortest lifespan and high reproduction rate among vertebrate model organisms, which makes it a suitable candidate for aging research. HAHM Jeong Hoon: We believe that there is a fundamental principle of aging that applies similarly to all plants and animals. Our aim is to find out common fundamentalcauses of aging using model animals and plants while discovering unique characteristics of specific species’ aging at the same time. A case in point is the study using C. elegans, an invertebrate, which discovered the link between an insulin hormone signal system and aging. HONG Sung Hyun: Plant aging research takes a slightly different perspective. It has been conducted mainly for applications in agriculture as the aging of plants hugely affects periods of flowering and fruition. As in the event of fallen leaves which used to generate nutrients through photosynthesis, plants actively use aging to redistribute nutrients when needed. Q: You mentioned ‘active’ aging of plants. Does it mean aging of plants is quite different from that of animals? HONG Sung Hyun: Not necessarily. Of course, there are minor differences in terms of the purpose of aging by different species and their ecological niches. However, plant aging research can provide important implications in multiple areas, including a biological clock. Diurnal and long-period cycle biological clock systems of plants can be also found in animals. So I think discoveries made in plant research can be a valuable clue for animal research. Q: Research of human aging takes a different approach from that of the Center for Plant Aging Research, as in human research employs various statistical methods. Do you interact much with this field? KIM Yumi: Statistical methodology is an inevitable choice in human aging research. For a proper aging study, characteristics of organisms need to be artificially manipulated to observe the effects on aging. However, you cannot perform such manipulations on humans for ethical reasons. Therefore, experiments using model animals are a critical. Basically, the human data obtained through statistical methods are verified in animal model experiments. For example, a long standing belief that overeating reduces life expectancy was recently proven in animal experiments. HAHM Jeong Hoon: In fact, we do quite a lot of joint research. We actively seek out opportunities to work with researchers outside our Center. Aging is a very complex phenomenon, which requires studies of various research cases and cross-checking. Q: I assume the three of you have different research backgrounds as you work with different research objects. Where did you conduct research before IBS? 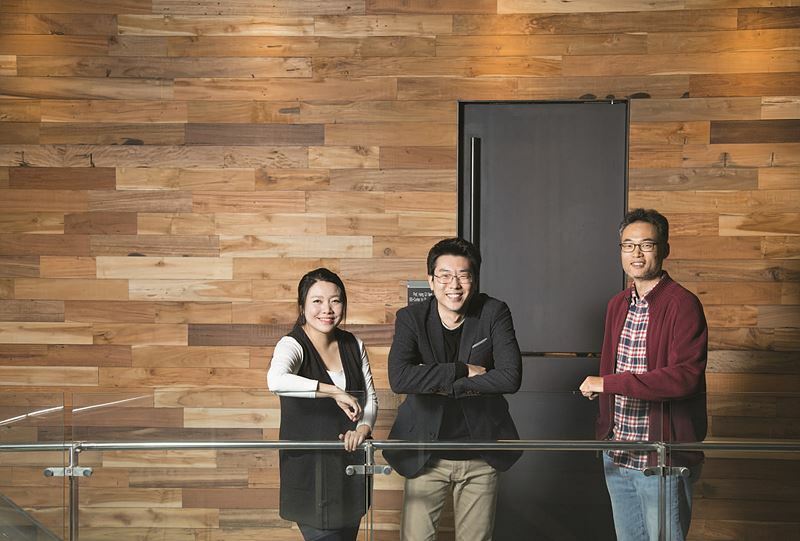 HAHM Jeong Hoon: I conducted aging control research on C. elegans at the Buck Institute for Research on Aging, which is a well-known institute for aging research in the U.S.
HONG Sung Hyun: My research before IBS was slightly different. I studied an optical signal delivery system of plants in the U.S. It was a mechanism study on how light controls the biorhythm of plants. Joining the Center for Plant Aging Research, I chose my research subject by combining the fields of biological clocks and aging research. Fortunately, the direction of my research matches well with that of the Center and many interesting results came out of it. KIM Yumi: I did my post-doctoral training at the Max-Planck Institute for Biology of Ageing in Cologne and studied the roles of DNA damaging in aging organisms using the turquoise killifish. Q: How are your research activities at IBS different from those at previous institutions? HONG Sung Hyun: It is nice to be able to fully focus on research. Researchers with multiple years of experience like myself are often required to carry out managerial duties while carrying out his or her own research. However, IBS allows scientists to be fully focused on research as administrative work like management is separated from research work. Another considerable advantage at IBS is the ability to conduct a relatively long-term project. This is especially important because aging research takes a long time. HAHM Jeong Hoon: It is also not common to have researchers from such various fields working on the same topic of aging all in one place. Three of us study different organisms so what we know or will find out vary as well. Complimenting each other’s research by interacting with scientists from diverse backgrounds broadens one’s perspective. In addition, what would normally require involvement of external research groups can be done within the Center, which increases the efficiency of research. KIM Yumi: I think one of the most critical things to do when it comes to aging research is comparing research results obtained from various species, which give us a high chance to understand fundamental and general aspects of aging mechanisms. IBS facilitates such comparison study. Q: I suppose it goes beyond simply sharing opinions, then. Are you actively engaging in deeply-involved joint research like crossover study? HAHM Jeong Hoon: I was pleasantly surprised during a discussion with plant aging researchers after joining the Center. The focus of animal aging research has mainly been seeking ways to extend lifespans. However, the aging process of plants is understood as changes of organisms’ functionality at precise timings and control thereof. This is called healthy aging research - a study focused on functionality changes during the aging process. In short, (plant aging research) efforts to understand functionality changes and how to control them have enabled studies on how to age healthily and well. 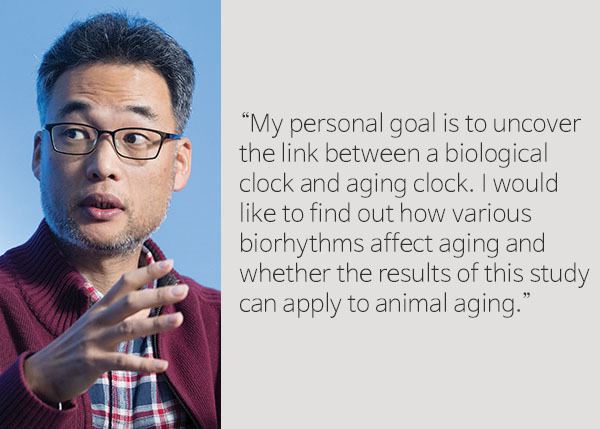 HONG Sung Hyun: My personal goal is to discover the link between a biological clock and aging clock. I would like to find out how various biorhythms affect aging and whether the results of this study can apply to animal aging. KIM Yumi: The biological clock is also becoming considerable on its role in aging. In a mouse study, it was observed that their time perception was disrupted due to malfunctioning daily biological clocks due to aging. This is a possible example of a connection between plant research and animal research. Q: I think the type of aging research that you do was quite rare in Korea before the Center for Plant Aging Research. HAHM Jeong Hoon: It is due to the lack of national research institutes specialized in aging despite the magnitude of aging research. As I am often made to feel, aging research requires as much cooperation among various fields as brain research does. That means scientists from multiple fields need to work in close proximity to one another, which is not an easy task for non-national research institutes. HONG Sung Hyun: In that sense, I hope to see the IBS Center for Plant Aging Research grow to become the core of aging research going forward. Q: I think the Center can serve as the hub of the aging research network. HONG Sung Hyun: Network is key. It is critical for researchers in aging-related fields to exchange continuously and create opportunities for joint research. HAHM Jeong Hoon: Our Center holds international symposiums almost every year to facilitate such exchanges. HONG Sung Hyun: Participants vary depending on topics. 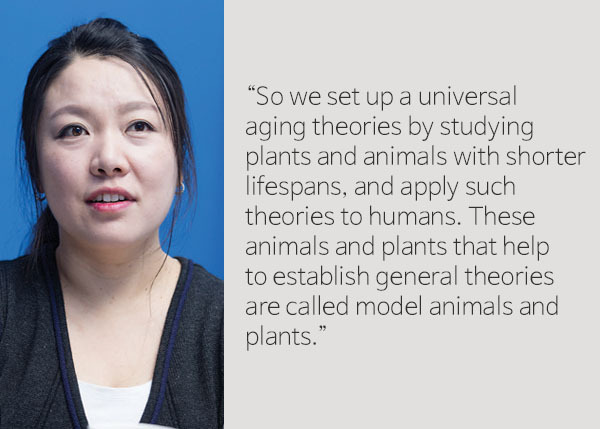 Plant aging-related topics attract a lot of European scholars while topics on animal aging bring many scholars from the U.S.
KIM Yumi: Many highly-respected scholars participate in the events. My former director at the Max Planck Institute for Biology of Ageing attended our symposium in 2015. I was impressed by the strong network of the Center. Q: The public’s interest in aging research is quite high. Are you also actively communicating with the public? HONG Sung Hyun: Our Center offers a program named R&E, which stands for Research & Education. It supports research project teams at high schools. I worked with students from Daegu Science High School on the topic of optical signal delivery and aging (for a science fair) when I was put in charge of the R&E program. The students received the grand prize from their school, and subsequently the president’s award from Korea Advanced Institute of Science & Technology (KAIST). KIM Yumi: I joined the Center last among the three of us but was also contacted for similar interests). A high school teacher asked for my advice about growing the killifish by explaining that he would like to teach his students about aging. 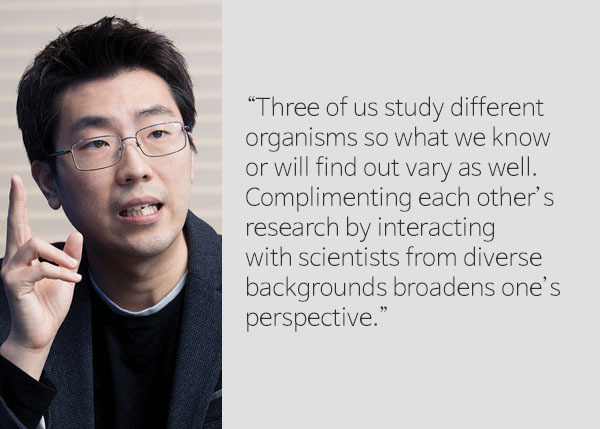 HAHM Jeong Hoon: I believe such activities are another advantage of group research. Sharing accurate information on aging is one of the duties that the research community should fulfil. HONG Sung Hyun: I try to accept all public lecture requests whenever possible since the Center needs to expand its base to grow as a comprehensive aging research center. A national aging research center will be established one day, but until then the Center for Plant Aging Research needs to function as one by actively communicating with the public. KIM Yumi: Working at the Max Planck Institute for Biology of Ageing in Cologne, it was impressive to see all aging-related facilities, including research labs, a hospital, and cancer center all in one place. Even until I came to Korea, new facilities were being added. That seemed like a desirable future of aging research. The Center for Plant Aging Research can function as a provisional national aging research center since scientists with various backgrounds are all brought together in one space. HAHM Jeong Hoon: One of the most important goals of the Center for Plant Aging Research is to discover ways to ensure healthy aging. The ultimate goal of our research is to find out how to enjoy a better quality life during a given lifespan. This means we need to go beyond a simple focus on how to delay death and live longer, and put a heavier emphasis on functional aspects. To this end, exchanges among diverse fields are crucial.